Friday 12th October – Australian Market Wrap | Beeks Downunder-Because not all financial news is boring! High 5904 Low 5847. More moderate volumes. Confidence builds. Buyers move back in after early losses. Hot stocks first to pop. Resources save the day. Energy under pressure. Bank CEOs escape at inquiry. Fade again though. Aussie Gold firms to $1712. US futures up 211. No to Chinese currency manipulation. Asian markets mixed with Japan down 0.30% and CSI 300 up 0.70%. SBM +8.04% gold price rise. APT +7.19% and they are back. FXJ -13.55% NEC -12.38% DHG -13.44% weakening outlook. SXY -1.03% oil price falls. MSB +4.79% completes Tasly deal. ISX +27.27% supply chain update. QAN +3.38% weaker oil price helps. LNK +6.01% change of directors’ interest. VHT +19.52% first screening purchase of VHT Enterprise. Speculative stock of the day: Biotron (BIT) +21.43% back again in the winners’ circle following positive HIV BIT225 trial results some days ago. Biggest risers – LYC, RSG, RRL, SBM., APT and A2M. Biggest fallers – FXJ, DHG, AMI, NEC, SWM, EHL and LSF. Nine Entertainment (NEC) – 12.38%Trading update ahead of the scheme booklet relating to the merger of Nine and Fairfax Media. NEC reiterated FY19 EBITDA guidance of $280-300m before significant items. The company’s notes digital revenues were around 10% ahead for the September quarter. Adairs (ADH) + 1.71% Morgans Queensland conference. ADH is targeting like-for-like sales growth of between 5%-8% in FY19. It notes the first 13-weeks of trading has delivered like-for-like sales growth of 5.2%. ADH forecasts FY19 EBIT of around $47.5m to $51.5m and sales between $345m and $360m for FY19. Domain Holdings (DHG) – 13.44% Trading update ahead of the scheme booklet relating to the merger of Nine and Fairfax Media. Digital revenue up 6% and total revenue down 1% for the first 15-weeks of FY19. DHG observes for the September quarter, new listings in the Sydney market were down 8% and auction volumes were down 22%. In Melbourne, new market listings were down 1% and auction volumes were down 18%. Fairfax Media (FXJ) – 13.55% Trading update ahead of the scheme booklet relating to the merger of Nine and Fairfax Media. It notes FY19 group revenues are down 5% on year. FXJ added it is continuing to implement cost-saving measures. RBA warns of heightened trade risk to world economy. The trend estimate for the total value of dwelling finance commitments excluding alterations and additions fell 0.6%. Owner occupied housing commitments fell 0.2% and investment housing commitments fell 1.2%. 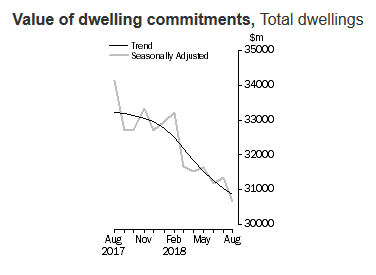 In seasonally adjusted terms, the total value of dwelling finance commitments excluding alterations and additions fell 2.1%. Chinese exports in dollar terms rose 14.5% in September compared to the same period last year, the customs administration said Friday, higher than the forecast of 8.2%. Imports climbed 14.3%, leaving a trade surplus of $32bn. US Treasury finds that China is not manipulating its currency. Over to you Mr Mnuchin. Doesnt make much difference as US is already at war with the Chinese economy. US earnings season kicks off tonight. Here are the things the FT is watching for. 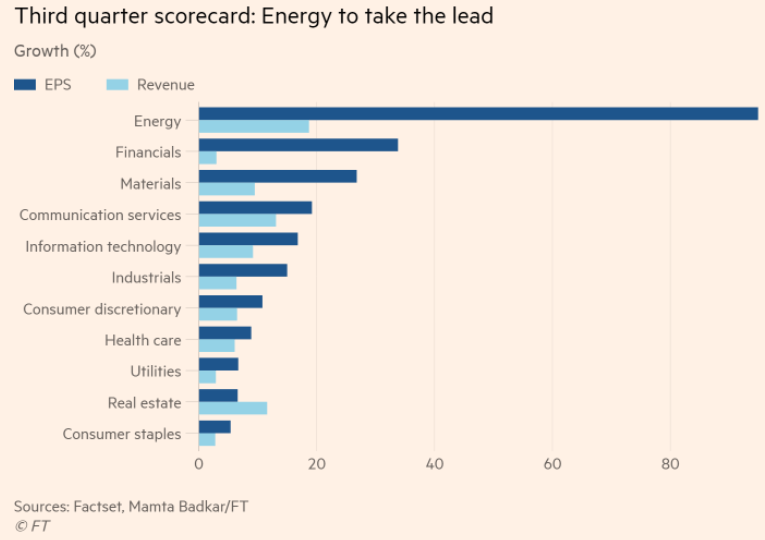 Corporate tax cuts, strength in the US economy, rising oil prices and share buybacks which are expected to fuel double-digit earnings growth. Here is the third quarter scorecard. 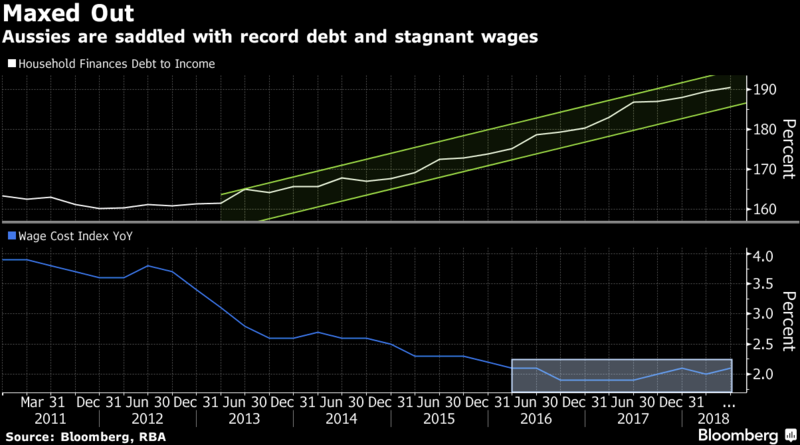 A survey of credit conditions, produced by the Bank of England, found that demand from borrowers has not fallen as lenders have become less willing to lend. demand for re-mortgaging increased “significantly” as banks have pulled back from lending and risk tolerance. Princess Eugenie gets married today. Yes, a Friday, apparently Windsor Castle is cheaper to rent out of the busy weekend period. The Royal family is paying, so has to count its pennies. So many weddings and who is Eugenie anyway? Finally, interesting that the ASX has lost $110bn of value since ScoMo took the helm. Coincidence? Just had my water bill of $175 drop on my mat. That’s a lot. Oxfam can supply a whole African village for just $2 a month: time to change supplier I think.